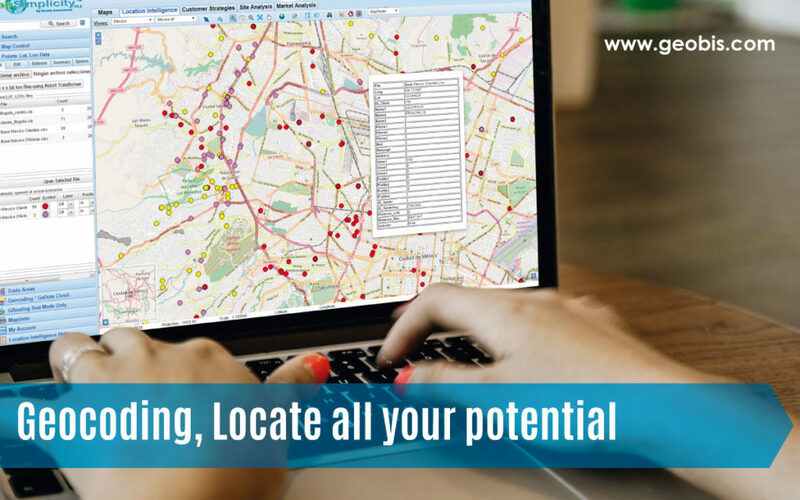 If you have wondered where your customers, competitors and suppliers are located and you want to understand how they behave, you will find in geocoding the first step to achieve it. Geocoding is a process of geographic location, within a coordinate system. In a simpler term is to locate an address within a digital map, associating to the point the coordinate and some sociodemographic data such as stratum, neighborhood, among others. In order to analyze the situation of a business in terms of location, this tool is used in Geomarketing. Knowing the geographic coverage of the area, detecting which areas are covered, which have the apropiate market potential and locate new sales points or marketing actions. Understanding the geographic location of customers on maps, reviewing where customers are in relation to the branch. Analyzing Customers, review the data of each client based on his sociodemographic profile and area of residence with the objective detecting which products fit within this target and thus generate campaigns according to market potential. For example, for telecommunications companies that have signal coverage maps can geocode customers and quickly see where they need to strengthen their signal services and where to create new services according to the demographic profile by economic strata. The business intelligence plan starts with an emphasis on strategic location: GEOCODING, after the points are located, you can complete the study with isochronous analysis, spiders, rings and even associate it with CRM applications to create an intelligence center for Expansion Plans, loyalty strategies, opening of new service locations and study market potential, all from the new Geobis MapSimplicity Analytics 3.0 – LAB cloud base super platform. Available for all Latin America and the Caribbean. The professional Geocoding services available in MapSimplicity environment are called GeDots which is a compatible solution with different types of applications such as: Intranet, Internet or apps.